Riding across one of the dykes, ocean on one side, inland sea on the other. Note the different levels. We followed back roads suggested by Petra and Egbert towards Amsterdam, leaving under blue skies, but it soon clouded over, and then the rain came. Not heavy, but enough to slow us down, and make the riding cold and miserable. Our route took us through Lelystad and over the long dyke, with locks at each end. It seemed strange riding over what looked like open sea on each side, but with the water at different levels. 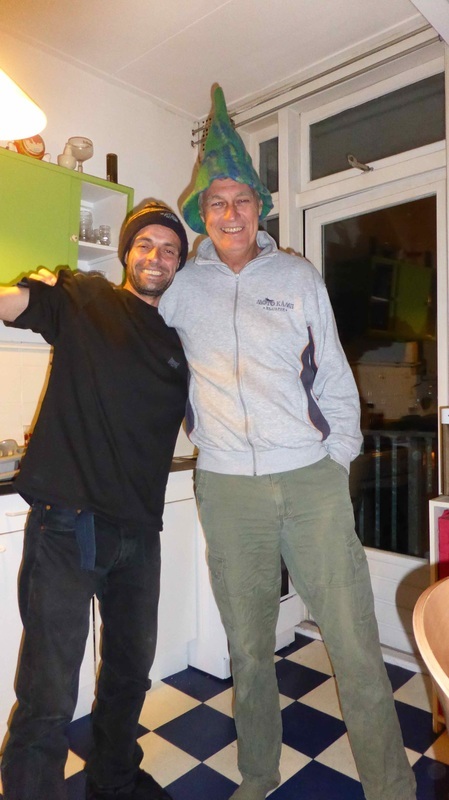 The GPS took us to Brian and Eva's place, the couple we met in Nepal. Great to catch up with them again. 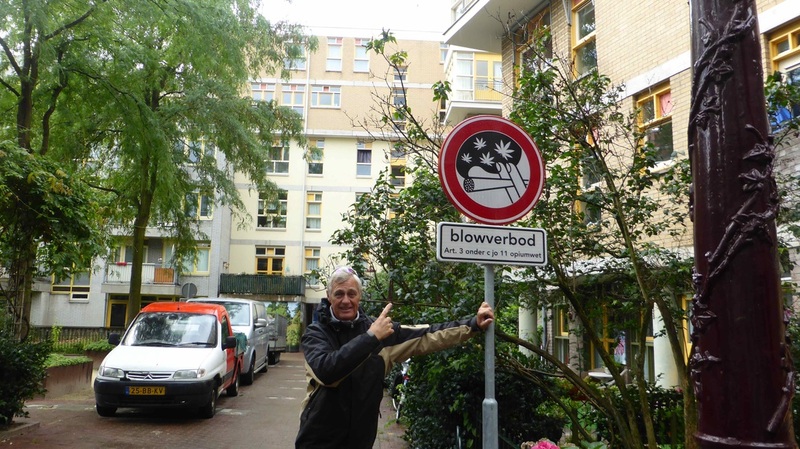 They showed us the sights of Amsterdam, including a night time wander through the red light district, very interesting, but no photos of the girls, not allowed, and strictly enforced! 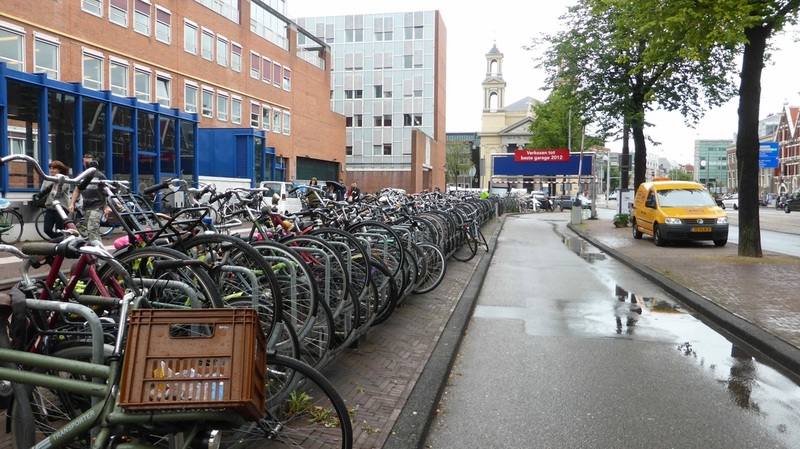 A tiny few of the million gazillion push bikes in Amsterdam. They are everywhere, with their own little roads, and look out when you walk across them, they ride quick!!! 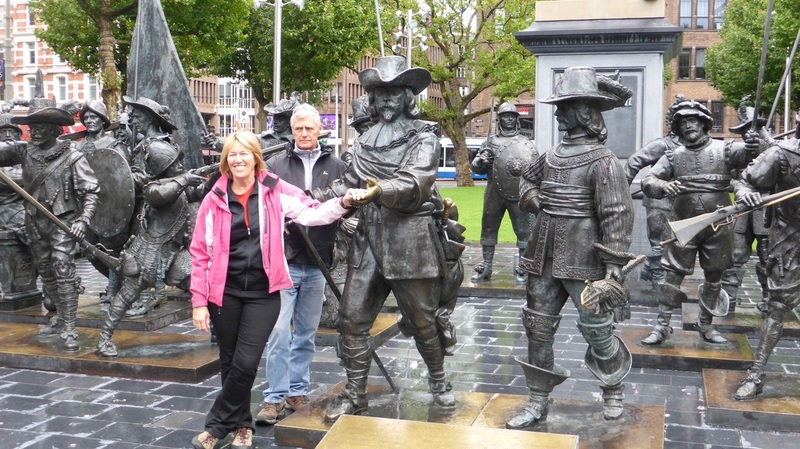 The statues of the soldiers depicting Rembrandt's painting of the Night Watch, in Rembrandt Square. I didn't realise it, but Amsterdam has nearly as many canals as Venice, with bridges everywhere. After a terrific, full on couple of days, it was time to move on. Brian spotted a broken pannier bracket on my bike, so I wired it up as a temporary measure, I would get it fixed when I was back in Germany. Thanks for a great few days guys, we really enjoyed it, even if you did make us drink too much, again!